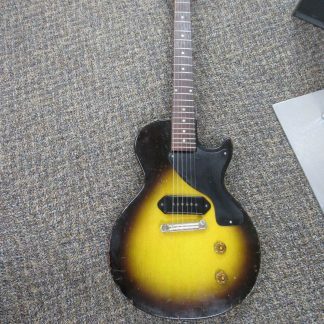 This is a very nice left-handed Made In Korea (not China) Epiphone Les Paul (Serial # U5060127) with an equally nice Canadian TKL Black Vinyl Wrapped Guitar Hard Case. Also included is an extra set of five strings (the sixth string, .012, was used to replace a broken string so is already on the guitar). Be sure to check out the many pictures and ask any questions.